Our group partners with multi-specialists and highly experienced engineers, with capability to provide complete Mechanical, Electrical and Plumbing (MEP) solutions on varying types of hospital constructions and specific individual services. Working with our partners we have delivered numerous projects internationally. These include challenging undertakings, such as expansion of the Rajiv Gandhi Cancer Institute and Research Centre in New Delhi, India. Using our experience in providing a full range of MEP, the expansion project was delivered in successive stages ensuring existing hospital operation continued without disruption. Once the main structure has been built and the equipment is in place, it has to be shown to be working. Usually before the design commences this has already been done, nevertheless we can provide valuable input. Our experienced, knowledgeable team are able to provide a comprehensive design service, handling the project from planning stage through to completion. We have extensive knowledge and experience in the medical supplies industry. We also have excellent partnerships with numerous leading medical brands. charity organisations. These are constructed for extreme weather conditions and custom made of high quality materials using cutting edge technology for energy efficiency to client specifications. 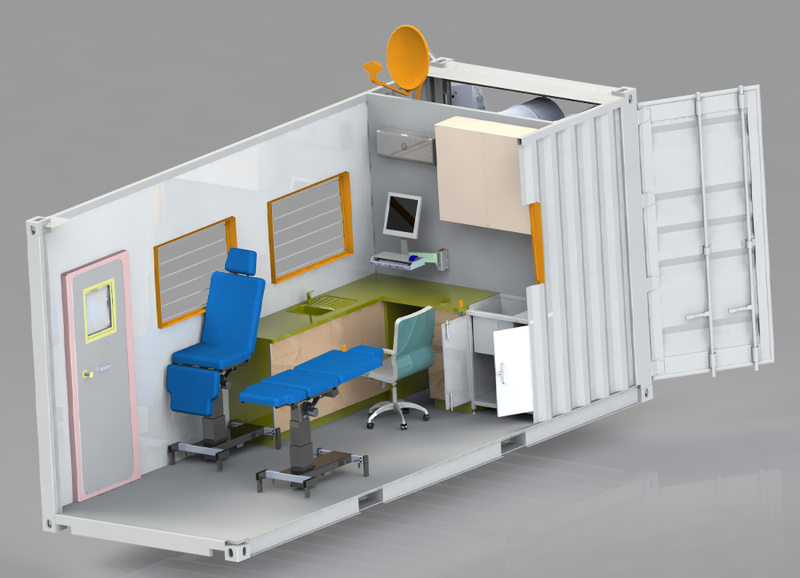 Our flexible platform can be configured for such needs as primary care unit, surgical suite, or any other medical space as needed by our clients. From the containers and metal studding down to the Armstrong flooring and Midmark cabinetry, our clinics are made of the highest quality materials and are built to last. Our clinics are solar powered have been engineered to be very energy efficient operating on less than 500 watts of electricity. Beginning with the planning phase, a site survey and land use analysis will be required. We’ll advise on the feasibility of size and location of the facility. Design briefs can then be prepared; advising on which clinical services a major hospital should provide. We are also able to discuss the size and scope of various services, e.g. How large should the maternity service be? We can assist in putting together the bid documents for the medical equipment package, advising on the bidding format and contacting various vendors. Our team can evaluate all offers, ensuring the equipment is to specification and meets the project objectives. We can even assist in negotiating contracts with vendors. Following up with suppliers, ensuring timely supply and track of all shipments. Allow us to professional organise and maintain the large amounts of required documentation. Receiving and inspecting all delivered goods, ensuring contract specifications and standards have been met.